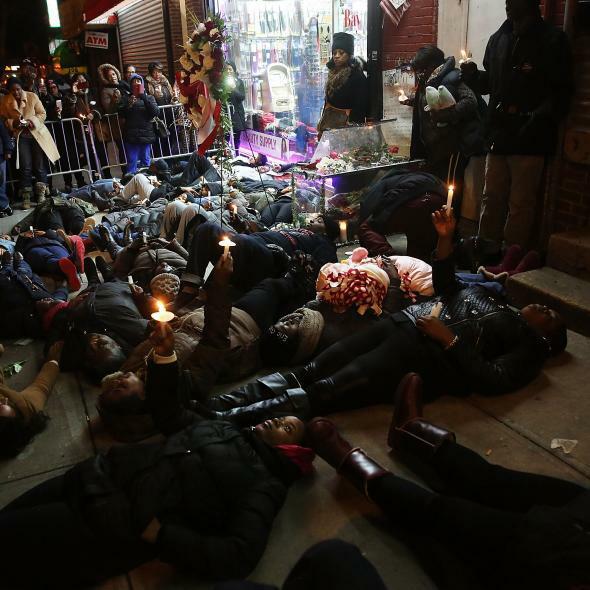 New York City settles with Eric Garner’s family for $5.9 million. Protestors at the location where Eric Garner was killed during a scuffle with police last year in New York City. The family of Eric Garner, who was killed last July by New York City police officers, agreed on Monday to a $5.9 million settlement with the city, the family’s lawyer tells the New York Times. Garner’s death at the hands of the New York Police Department was caught on tape as the officers circled Garner and officer Daniel Pantaleo tackled him using a chokehold. Garner pleaded “I can’t breathe” as Pantaleo choked him to death. Garner was thought to be selling cigarettes and was unarmed. The death was ruled a homicide by the medical examiner; a Staten Island grand jury decided not to indict Pantaleo. Garner’s death and the grand jury’s decision not to indict Pantaleo spurred nationwide protests.